Actually, in many ways it seems like it should have been “that time” months ago! 2011 was painfully long in many ways, but shockingly short in others. I’ve been doing battle with myself for nearly a week now about this post. I really didn’t want to face it. That doesn’t say much for my personal resolve to see my goals as just that – goals. They aren’t set in stone, nor a measure of failure vs. success. They are meant to be a guideline to keep me focused during the year – something I really need! But I need to be kind to myself. I survived an amazingly tough year! I never dreamed on January 1 even half of what happened – of how my year was going to be reshaped. I didn’t imagine getting a new car, competing in 5K races, learning to set up an IV and give injections, or planning a funeral, nor did I think I’d lose two of my closest friends. I’ve grown and changed dramatically in the past year, and I’m thinking it might take another year before it all soaks in! So, all that said, here I go again with the goals. This list is nearly a carbon copy of last year’s list. That was tough on me, as part of the excitement of New Year’s Goals is leafing through the files in my mind and deciding which of my life “wanna do’s” I’m going to try to tackle in the coming months. I had very little of that this week, and it’s disappointing. However, the goals I set last year are still very valid – still things I do really want or need to do, so I’m sticking with them with about a half dozen changes sprinkled through the list. Make another 2 pairs of handknit socks for myself and 2 pairs on my CSM. Finish at least 3 of the projects currently languishing in my WIP/UFO tubs – at least one item started before July 1, 2010, and the other two any time before July 1, 20111. Weave something on something other than a triloom. Move one of my dolls from hospital patient status to display status – maybe Aaron, so he can show off his adorable knitted romper? 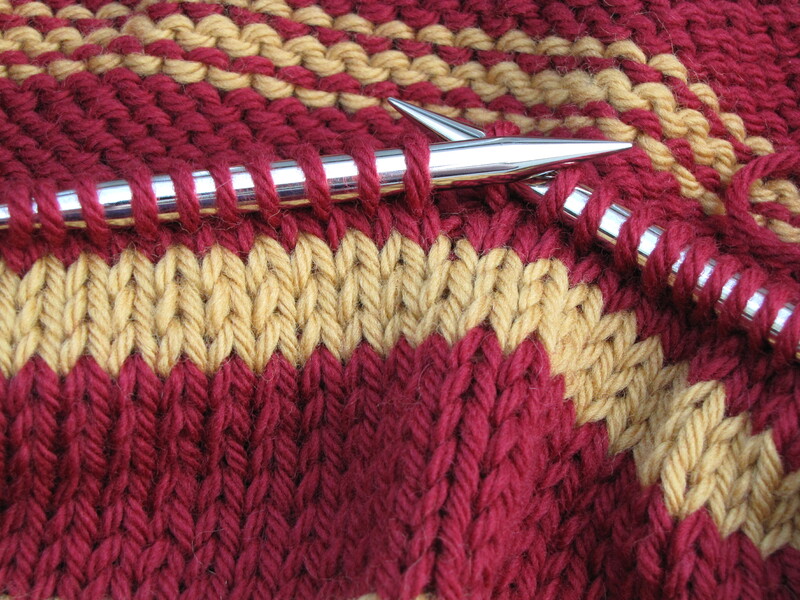 Stash all my yarn on Ravelry – which will get done one of these years if I keep at it! Have all books properly shelved. No stacks, floor rows, or double shelves. Get my entire bathroom “wonderful” – tougher than it sounds! Walk 250 miles and participate in a 10k race. Since I just has my wonderful Fiber Adventure Week with so much “playtime,” when I packed for my trip, I took important stuff with me instead. To be quite honest, with what I packed, I could have stayed for 3-4 months before I’d have been in danger of running out of work to do. I had a few grand accomplishments and made some great progress on things. It’s amazing how much more gets done when there’s no internet, pets, housekeeping, and in-law attics on my daily schedule. I could use more time like that! One huge, but no photo, project was working with my daughter to complete 15 pages in a scrapbook I’d assembled with contributions from friends and family in honor of her 16th birthday. The combination of trying to do both a scrapbook and quilt secretly while homeschooling the girls and the fact that there are a lot of procrastinators in the world kept me from getting it entirely done in time for the big day, and somehow we just never quite finished it. It’s very close to completion now, though, and we hope to see it done by the end of the year. One big sticking point is trying to locate a picture of Fairfield Elementary School, which was in Highland, Ohio. The school has since been razed, and hours of searching have so far shown me no pictures. I can’t believe that NO one has a photo, but whoever it is doesn’t seem to have posted it online, and all local sources I’ve checked have come up empty as well. 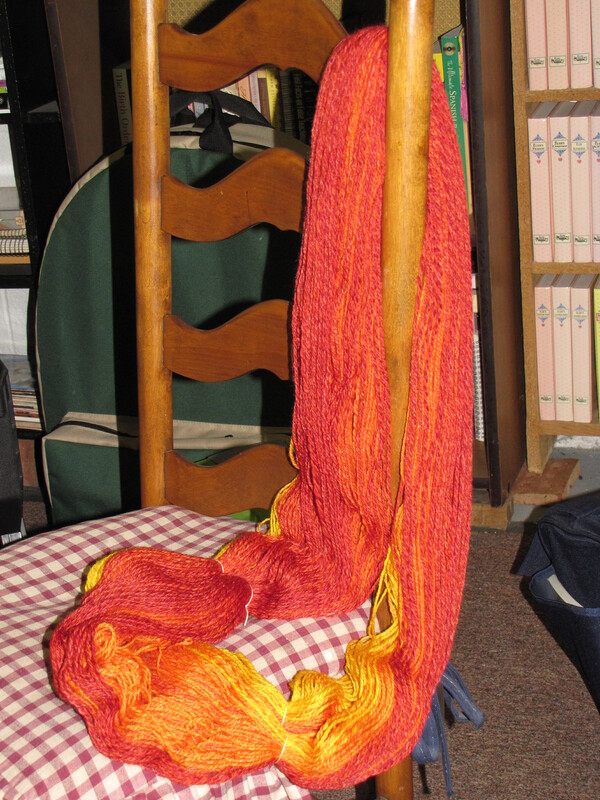 The yarn I started spinning during Fiber Adventure Week is plied, washed, and fantastic! 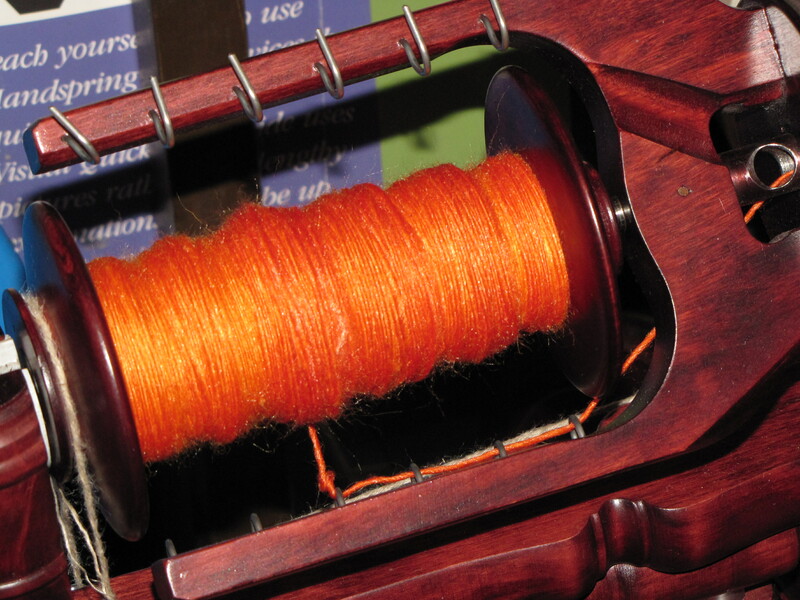 I was counting on human imperfection causing the colors to change at slightly different rates in each of the three bobbins of yarn, with the hope being a very gradual shift in color over the length. This both worked and didn’t work. The imperfections exist, the shift is gradual, but it was a little bit TOO imperfect, and I reached the end with very unequal leftover singles, leaving me very little solid black yarn. 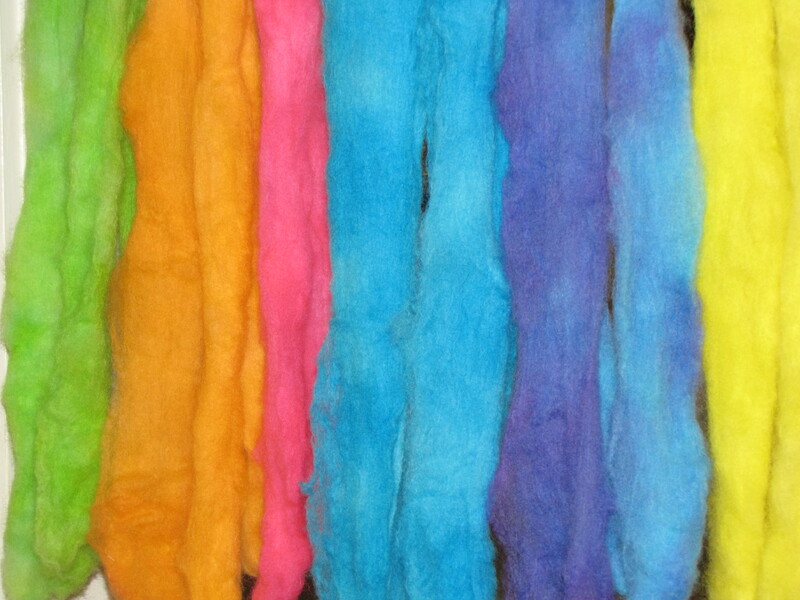 I think I’m going to write to Kimber (Fiber Optics) and see if she can make me a bit of solid black roving. 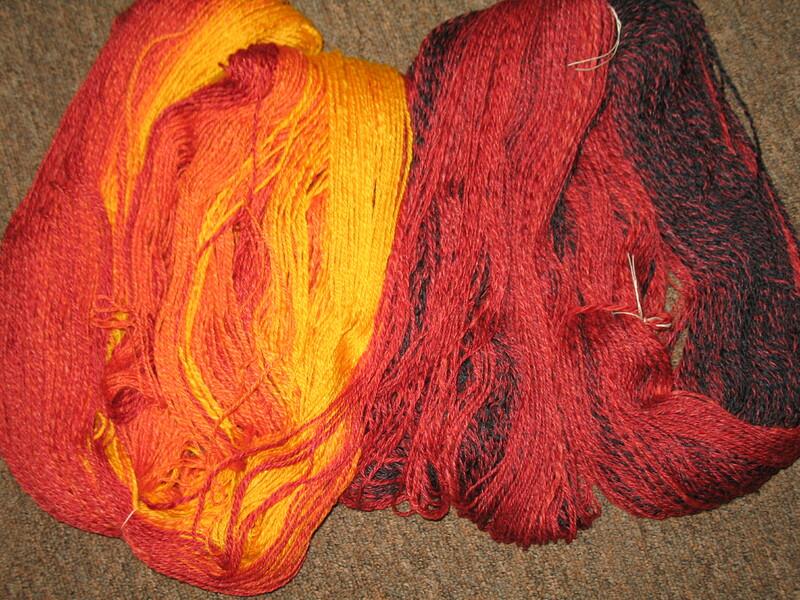 Speaking of which, I spent hours making mini yarn skeins and then started the dyeing portion of that homework. Her stove was giving me fits, though, and I had a few unfortunate occurrences. I finally decided to pack that project in for when I was at home, and I’ve not looked at it since I came back. Hopefully I’ll feel better about it for having been distanced from it for a few weeks now. No pix at the moment. I’m sure I took some, but must have missed them when I transferred things after I got home. 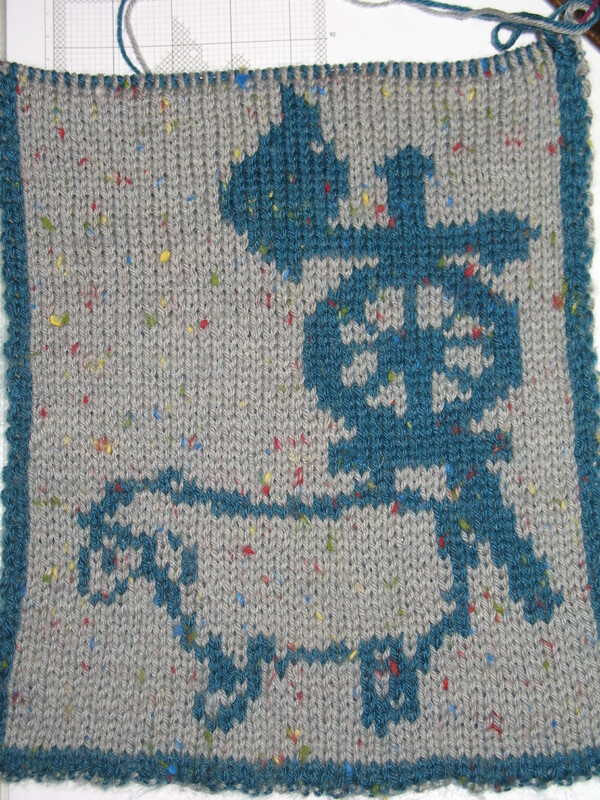 My other really big milestone was finishing the first panel of my Burridge Lake Afghan. I was “only” six weeks behind schedule when I did that, and I’ve not made up any more time since. I’ve only done one and a half repeats of the center panel so far, and it’s supposed to be entirely done by the end of June. I’ll just say now that it’s not going to happen! It seems that as I was leaving town (and the internet), MyPhotoAlbum announced that they were closing the site at the end of May. I had so very much info stored there and nowhere else… Several years ago, in fairly rapid succession, Yahoo photos and Epson’s photo site both closed down, leaving me in photo-shock. People warned me away from free photo sites, saying that they are very unreliable, and that I should go to a paid set up. Enter MyPhotoAlbum. I spent untold hours setting up beautiful albums and moving all my doll stories to the new location, rewriting as I felt necessary, and when I was done, I was extremely pleased. I absolutely loved that site. In the past three years, hundreds of people have enjoyed my picture albums and stories. Now suddenly, that’s going to be gone as of midnight on Monday. It was obviously a priority for me to salvage all my captions and pix from the site, and it took many hours over the past two weeks to accomplish that job. At this point, I don’t know if I’ll ever put them back online. Twice burned; twice shy. And it’s so much work to get it all set up. On the other hand, I do so love sharing the stories… Anyway, I just thought I’d mention it here in case anyone wants to see the albums one more time before the site closes. There’s a link in the sidebar here. And the fun continues! What a shame I can’t do this EVERY weekend… but I have to say that the house is a total wreck with so much equipment out all at the same time. I’m having a blast, though. :o) You want to know what I did on Saturday? Okay, here goes! With a little more effort, along with the dregs of my oil, which appears to have evaporated (can oil do that??? 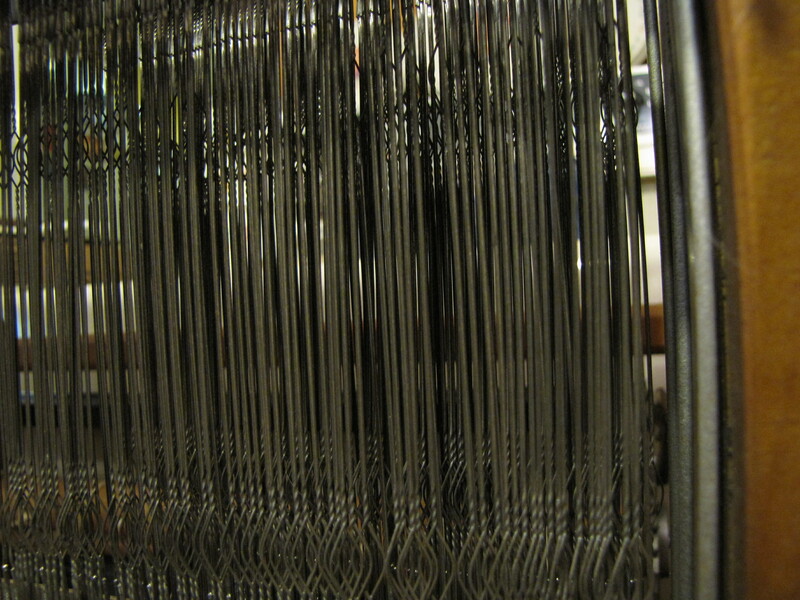 ), I got the machine cranking fairly decently, though it’s still holding stitches at times and not knitting as nicely as it was last year. 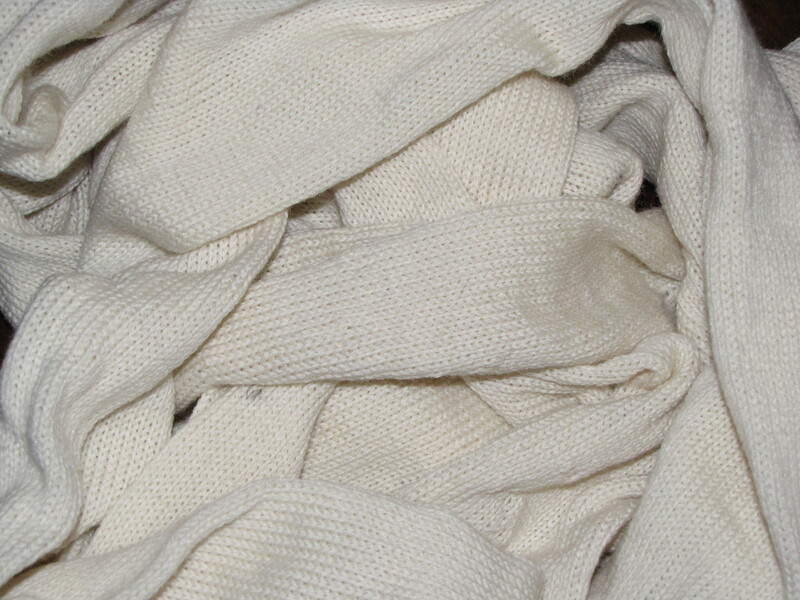 And a little while later, I had 7 yards of not-so-perfect-but definitely-good-enough-for-the-planned-purpose tubing knit. Now I need to find out what sort of oil I have to go buy. I can’t do socks on it without that. Last but not least, I watched the DVD How I Knit by Rita Buchanan while I was cranking out my tubes. It was light and interesting, but not as in depth as I’d expected from it being a 2 disk set. It also isn’t very good training toward my MSP certification. 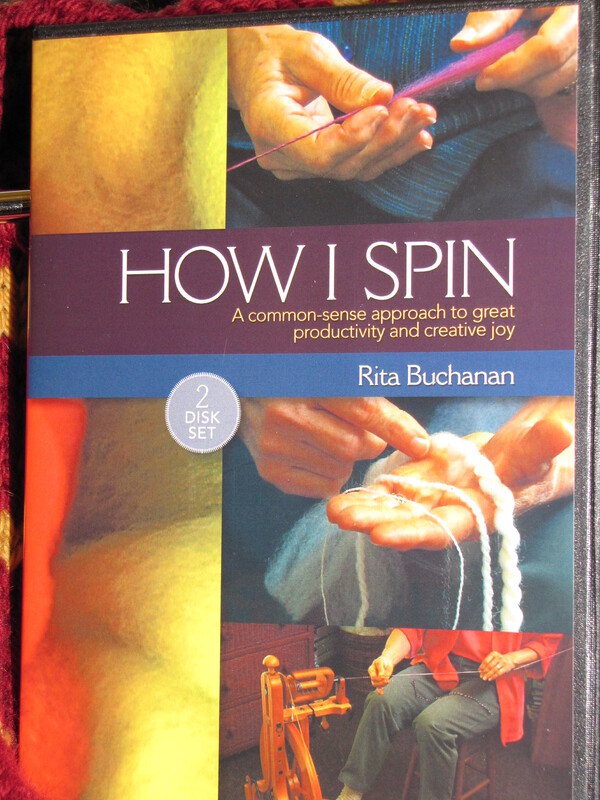 Buchanan obviously loves what she’s doing, and she makes beautiful yarn, but she works rather freely and organically, openly ignoring some of the rules and techniques and even terminology that I have to learn to manage in order to complete my lessons. 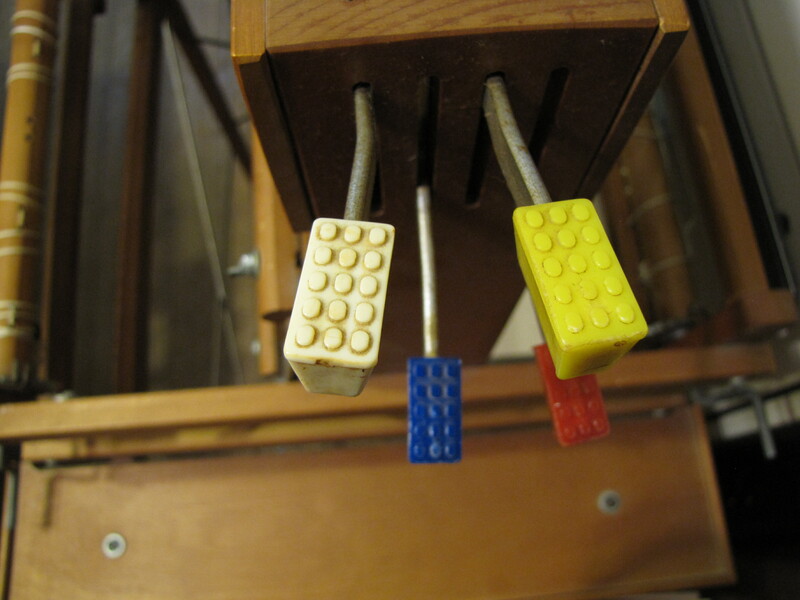 A large part of this set is also a bit more simple than I need. It was nice to watch her make yarn and to see some approaches that are different than I’ve seen with my limited exposure to other knitters, but I’ll probably tuck this set on the shelf for a while right now and look for something a bit more technical. I’ll try to remember to post what I find. Okay, that’s it for Saturday’s activities. There’s one more day to go yet, and I’m eager to get with it! 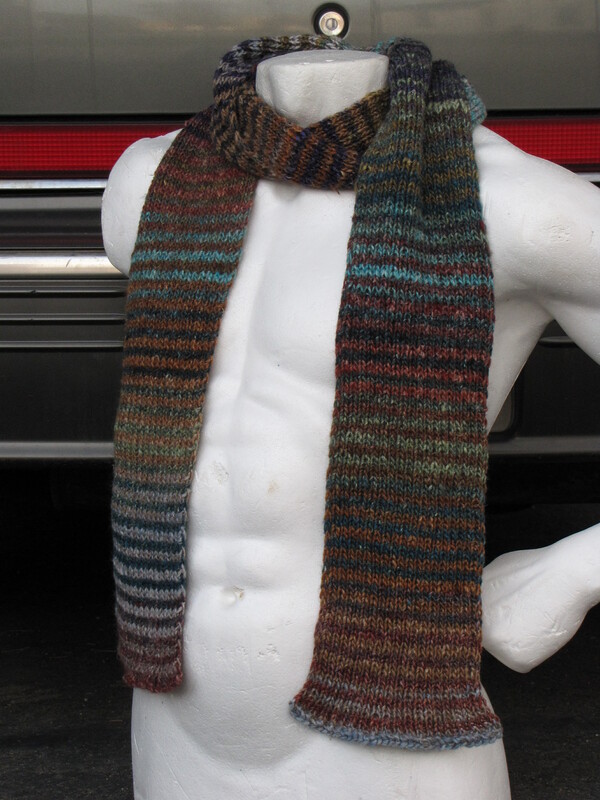 So, with this scarf off my needles, I need another item I can pick up and put down without a thought, so… Yep! I cast on another project. I’ll be really honest, though. 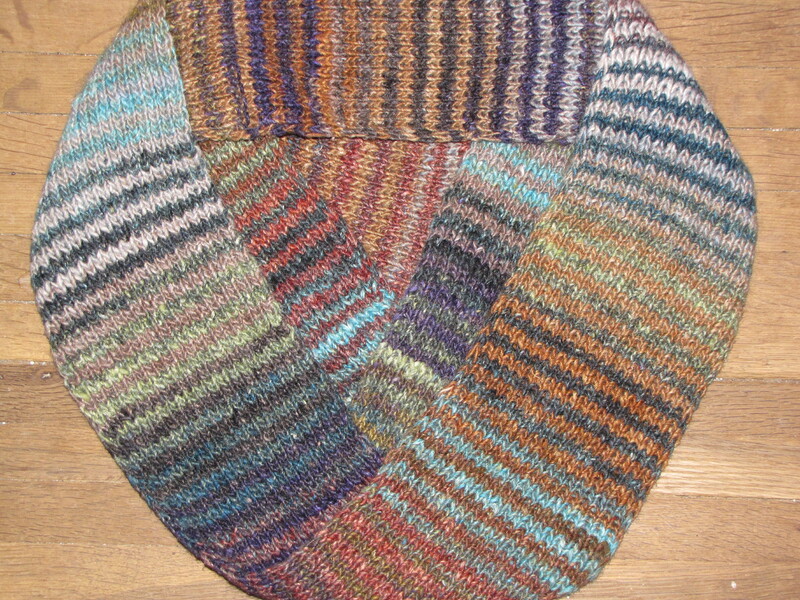 I’m not at all sure this is going to work as well as the Noro scarf did. Could That Be the Sun? 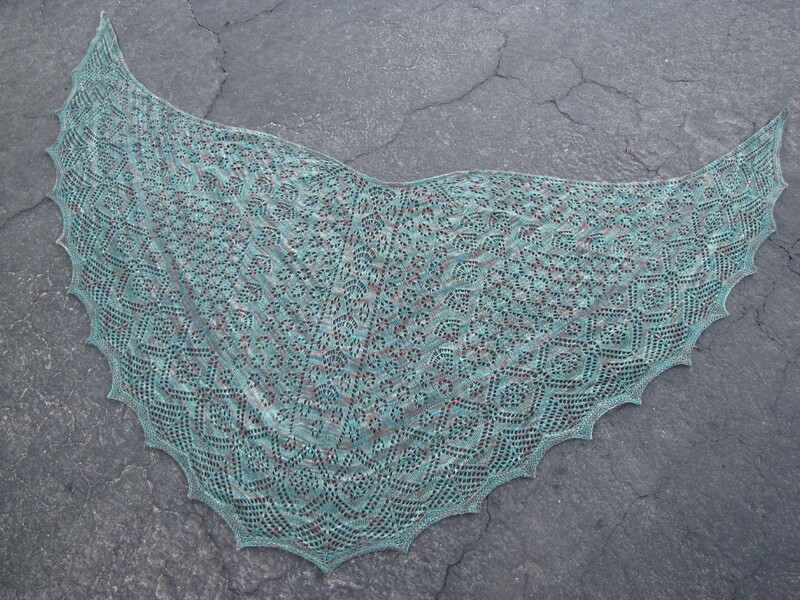 This is my Jade Garden, and I so love this shawl! Knit with Dream in Color Baby in the Good Luck Jade colorway, using Sivia Harding’s Shetland Garden Faroese, it’s a treat from cast on to bind off and beyond. Right now I feel as if I’m enjoying an embarrassment of wealth in terms of really grand knitting projects. I scarcely know which I want to pick up each day when I sit down with my audiobook. I’ve been really bad about sharing them here, mostly because when I get free time, it’s tough to keep my hands off my knitting long enough to write a blog entry. I can’t ever remember a time when I had FOUR pet projects! Don’t get me wrong; I have a whole heap of UFO’s, and I’ve frogged the ones I don’t like, so there aren’t any losers. 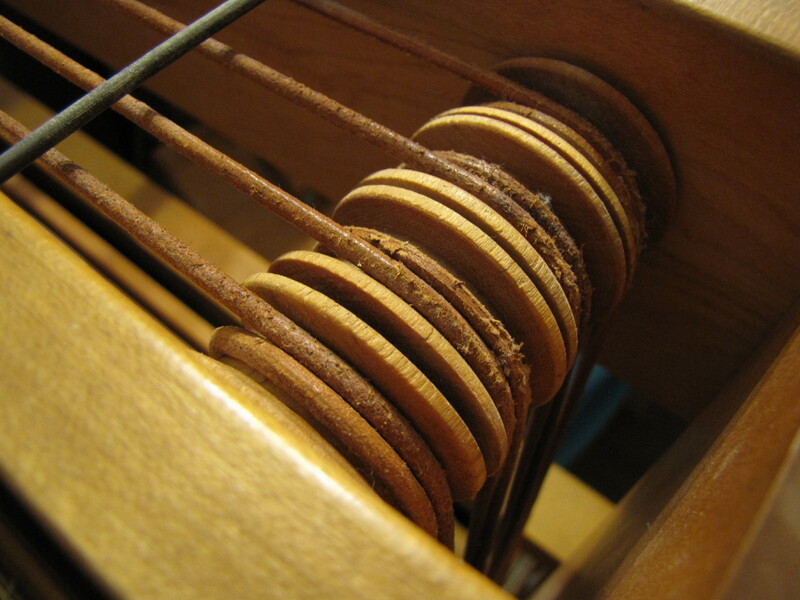 But you know how you tend to get a bee in your bonnet about one particular project and have a tough time putting it down for a few days or weeks – or until it’s time to do the finishing work on it? I have four of those right now, and it’s about making me dizzy! Let me introduce (or reintroduce) you to two of them. On January 1, 2009, I cast on a long anticipated project – Shetland Garden by Sivia Harding. I knew I had some busy days coming, but I actually thought at the time that I’d have it done in a few months. Not. In fact, a few days into the year, I tucked it away ’til the next day, and that day turned out to be January 1, 2010. Oddly enough, history repeated itself, and this much desired project mellowed for another full year. Almost a joke by this point, I pulled it out again on January 1, 2011, fully planning to purposely pop it back into the project tub by the end of the first week of this year this time. You know… fine tradition and all… However, the strangest thing happened… nothing weird, new, or unexpected. I wasn’t quite sure what to make of this situation. As busy as my life has been, NOTHING got in the way of me knitting this shawl, and better yet, it began growing almost magically. I have this weekend off from working at my FIL’s old house, so I’ve dedicated some of the extra time to the things I love doing – sort of an in home (much needed) winter retreat – and about an hour ago, the unbelievable happened; I cast it off and sewed in the ends. Then I sat blinking in amazement. It’s done. What will I do next year on New Year’s Day? Should I have done this to myself? No, I’m NOT going to frog half of it from guilt. I’m not quite THAT crazy… yet. 😉 Finishing this has also given me another quandary. I’ve been longing for some decent snow, so I can do some more snow dyeing. 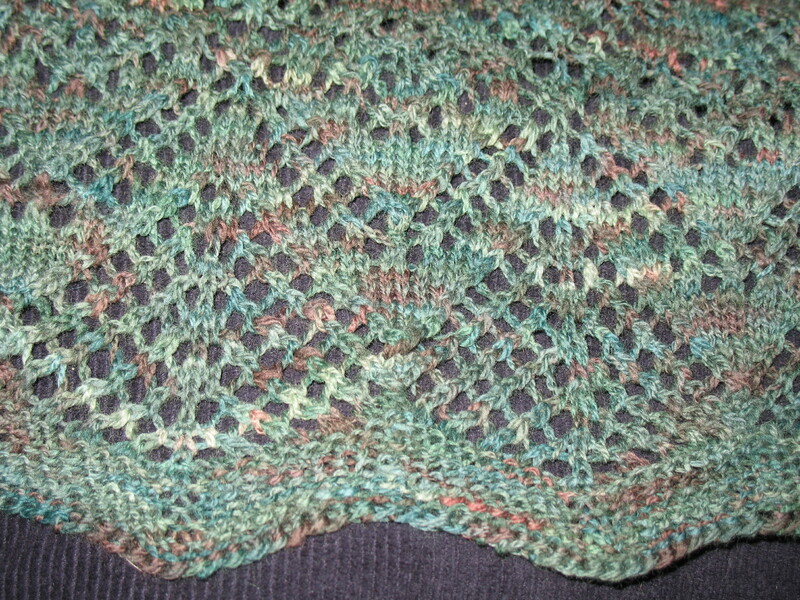 Now I also need a beautiful spring-like day so I can block my newest shawl. It’s liable to be awhile, so I’m posting pix of it unblocked for now, just to share the excitement of being this far with the project. I did make a few changes to the original pattern. First, I know myself well enough to know that mirroring the decreases was mandatory for me, Shetland tradition notwithstanding. 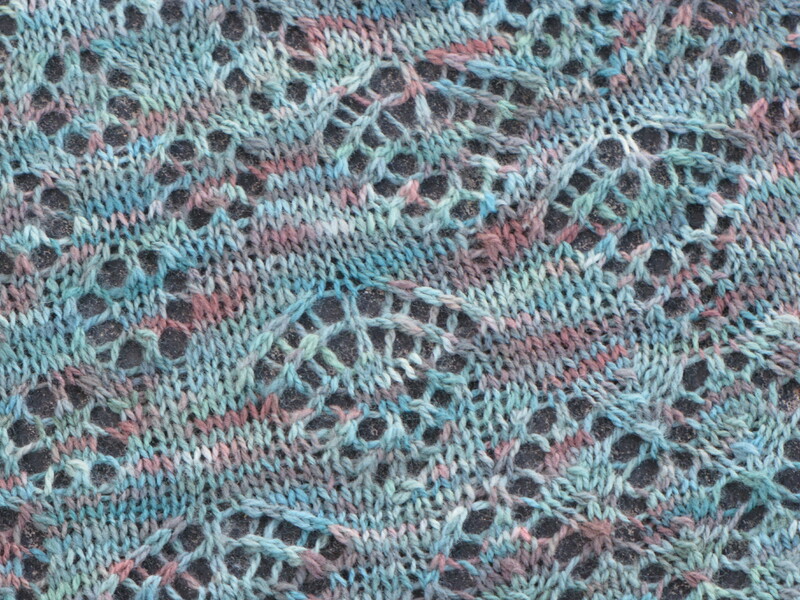 On a cobweb weight yarn, it wouldn’t have really mattered so much, but with Dream in Color Baby being a rather heavy laceweight, more akin to sock yarn, the lean of the decrease really makes a pattern impact, and I love the way those lines make a secondary pattern in lace, so I did the mental gymnastics to make them symmetric. 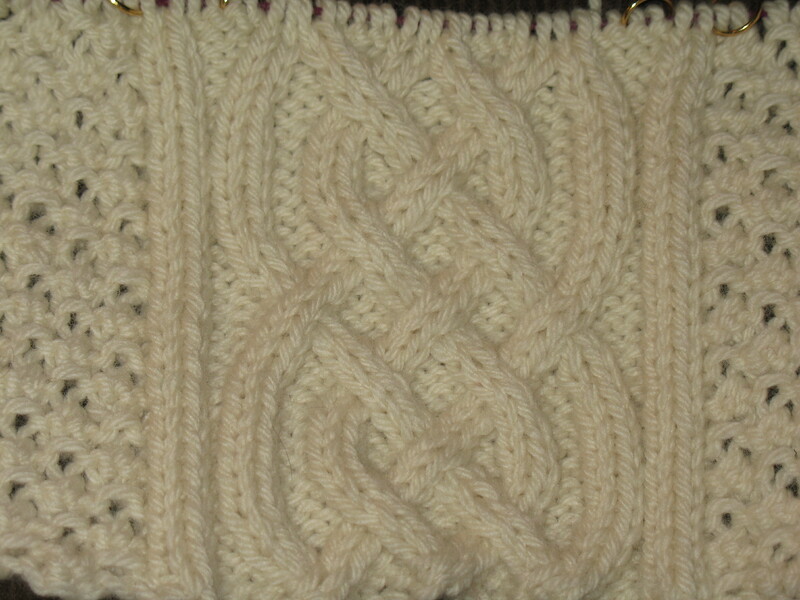 Another 2011 Goals item is to learn to double knit. I’m happy to say that this is coming along quite well. 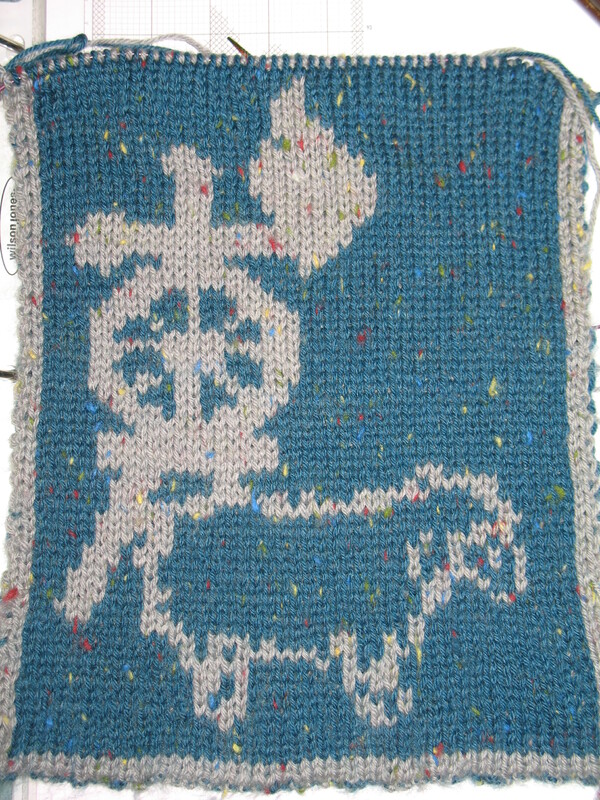 I also must confess that I’ve apparently developed a new addiction… After watching Lucy Neatby’s wonderful DVD, Double Knitting Delight, again, I jumped into the deep end, choosing a fun chart by tina13 on Ravelry called Spinnschaf. 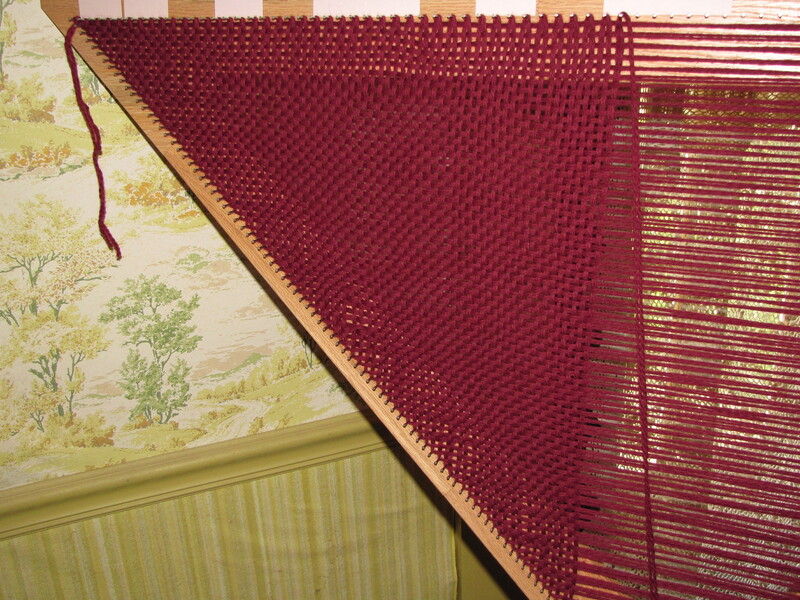 Tina doesn’t give instructions, but she sure makes some grand charts for double knitters, and she posts them for free. 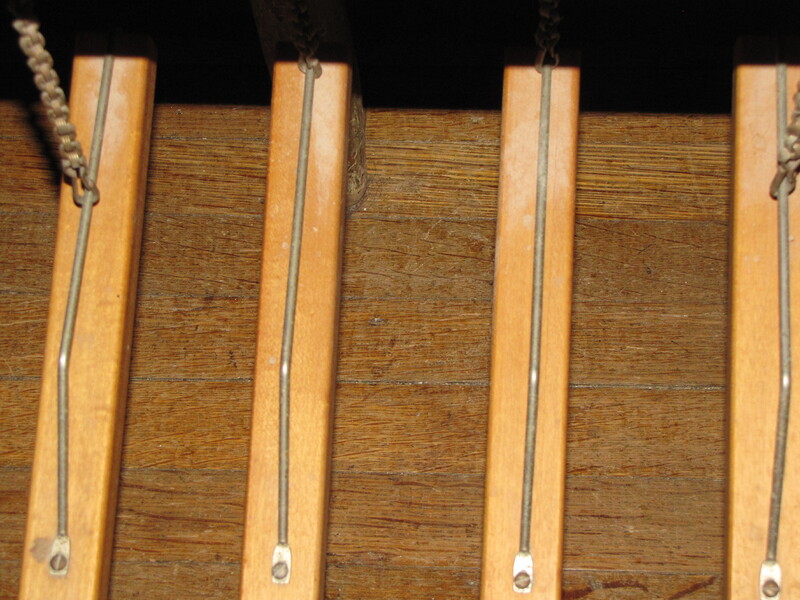 They are great for people with some experience – or anyone who is just a plumb crazy beginner. 😉 Why pick a simple, large scale geometric pattern for your first project, when you have the option to pick something with oodles of details that will tie your brain into a Josephine knot, right? 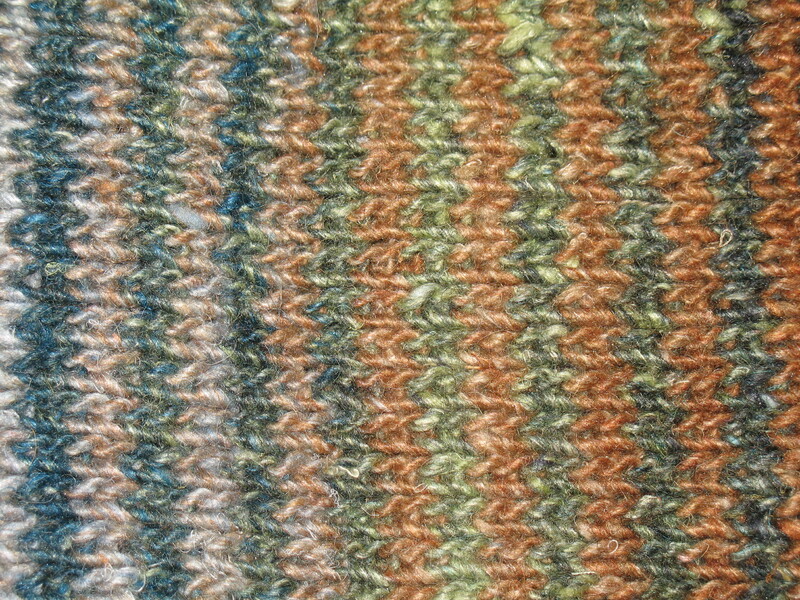 It took me more rows than I would have liked to figure out just exactly how one does the edges correctly, and I’ve had a decent amount of experience, now, fixing various sorts of mistakes, but overall, this has been a really great experience, and I love the magic of knitting two sides at once, watching them come out as negative images. I’m also really loving the Stroll sock yarn from KnitPicks. I’m working with two lovely shades of the tweed, and I’m losing at least 5 minutes per work session just enjoying the way it feels. No Requiem for the Beast! 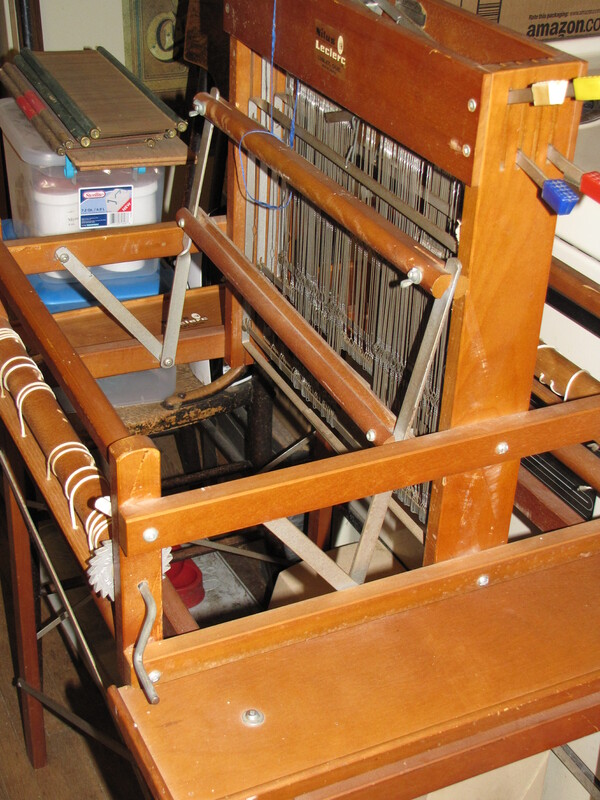 I said yesterday that it’s been an eventful week, and yes, getting two great new looms would qualify a week as eventful, but that’s not the whole of it. Working toward another of my 2011 goals, though I’d have done this goal or not, I have another wonderful, new treasure in my life – the first thing I bought with my Christmas money. Are you sitting down? Yes – a new toilet!!! And after battling to get a plumber here to install it, firing the first and hiring a second, it was finally installed yesterday. I’m SOOOOOO happy! 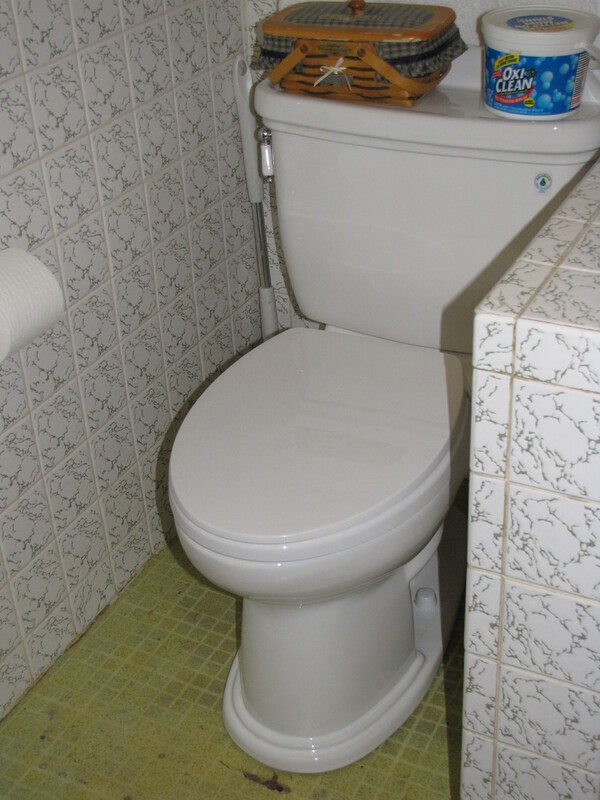 This toilet actually does what a toilet is supposed to do – flushes and takes what is in it away when it does! 😀 I bought a Toto Dartmouth, which flushes with less than 1.5 gallons of water, has a higher rim height, which means it’s easier on my long legs and bad knees, and is styled in the way I want for my future fantasy bathroom remodel. (Think I could use a new floor for starters?) I also opted for the Sanigloss finish and the Toto soft close seat. The seat is actually the only thing I don’t particularly like. The soft close feature is nice, but the seat itself is sort of funnel shaped, sloping down into the bowl from the high outer edge, and I don’t find that to be especially comfortable. I’m also used to being able to sit on the closed lid, and this isn’t as solid as the wood I’m used to having. 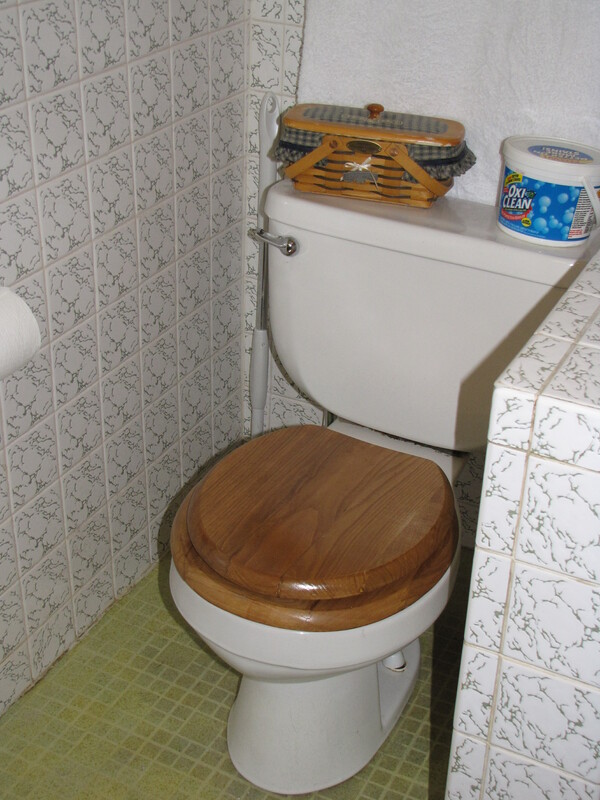 Toto has a wooden soft close seat, but it cost half again as much as I paid for the toilet, which I found for the best price online at http://www.nationalbuildersupply.com. BTW, my purchase arrived very promptly and extremely well packed, and the service rep I spoke with was friendly and well informed. I’m definitely planning to deal with them again. Do I feel any remorse in seeing this go? Not a single tear shed! 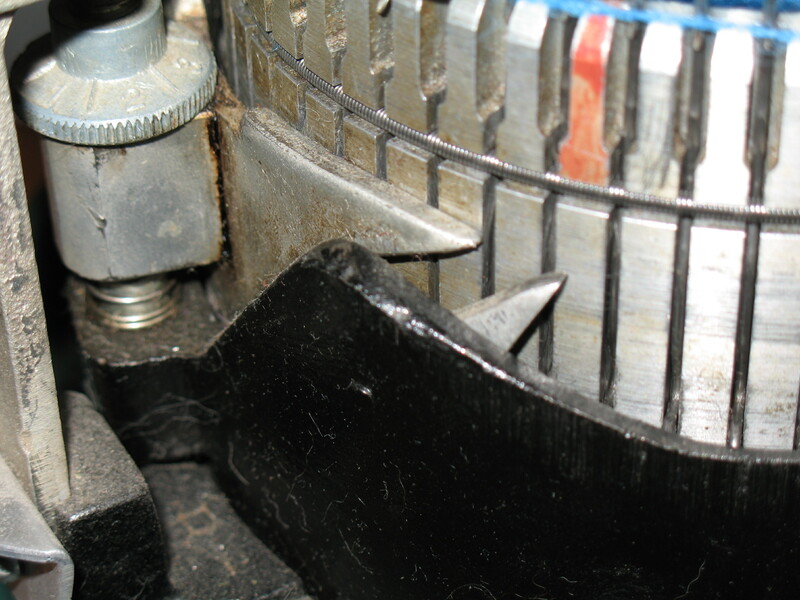 This Eljer has been hateful from the moment it was installed. It could barely swallow paper on a good day, and non-liquid flushes have required 3.2 gallons of water from the tank, and auxiliary bucket, perfect timing, and a bit of luck. To say I’m currently fascinated to have a toilet that works perfectly every time and with virtually no water is an understatement. Quality of life just went up dramatically here! Am I weird for loving my new toilet??? And in case you are keeping score, yes, I got a Dorothy loom and a Toto toilet this week. Gotta wonder what’s next… and I’m hoping there isn’t a wicked witch involved! The Year of the Cable? 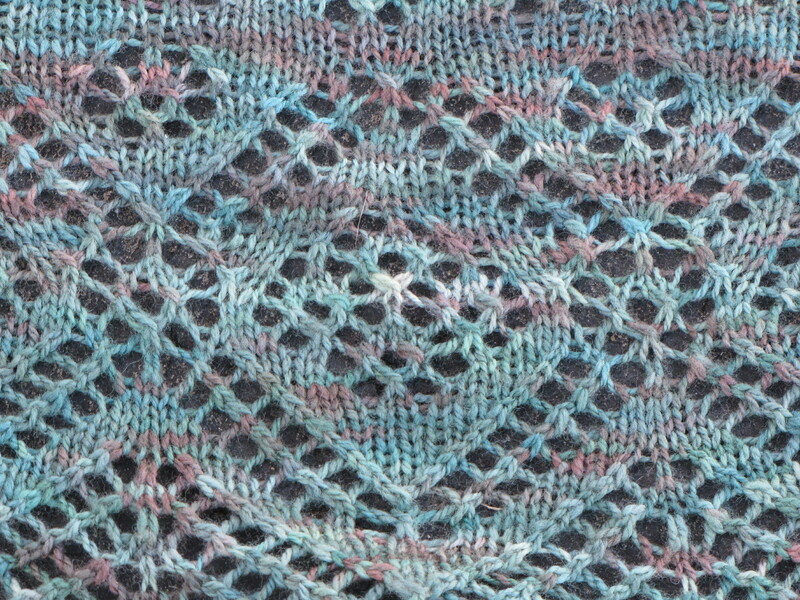 Anyway, on my Goals 2011 list, I have “Knit Burridge Lake Afghan,” and when I started doing some math the other day, I realized it was an excellent idea to cast on for it right away. I want to pace it throughout the year – maybe… if I don’t totally obsess over it, which is a definite danger. It divides neatly into 4 sections – the three main panels each being one, and the two end panels and sewing up being the fourth. Currently, my “plan” is to finish one section each quarter of the year, with this being primarily a Sunday knitting project for me. With that in mind, this past weekend I cast on for Panel A, and Monday (yes, already cheating!) 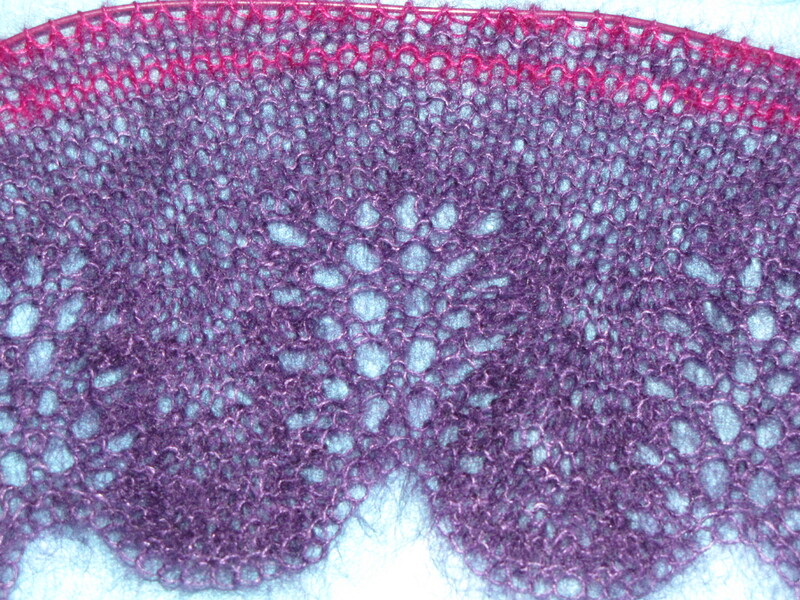 I finished the second of this week’s two repeats. I’m madly in love! 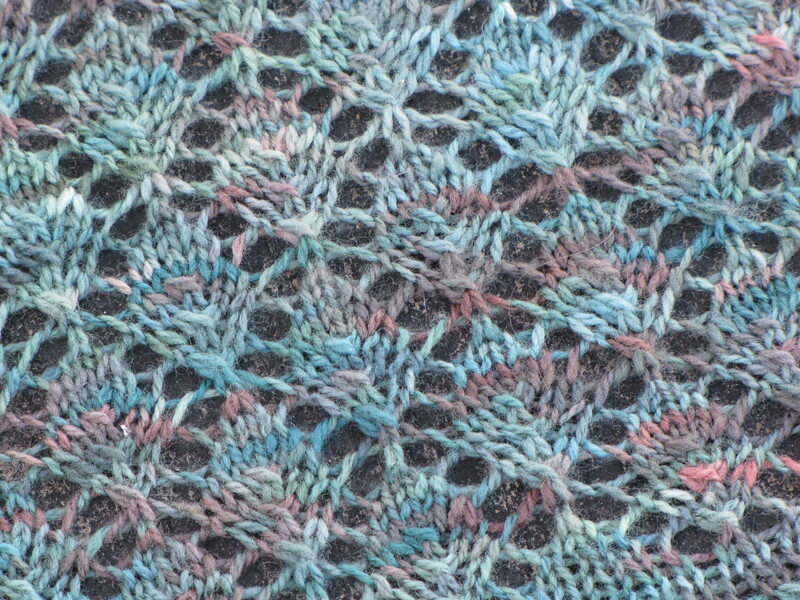 I love the pattern; I love the yarn; I love the way it looks! 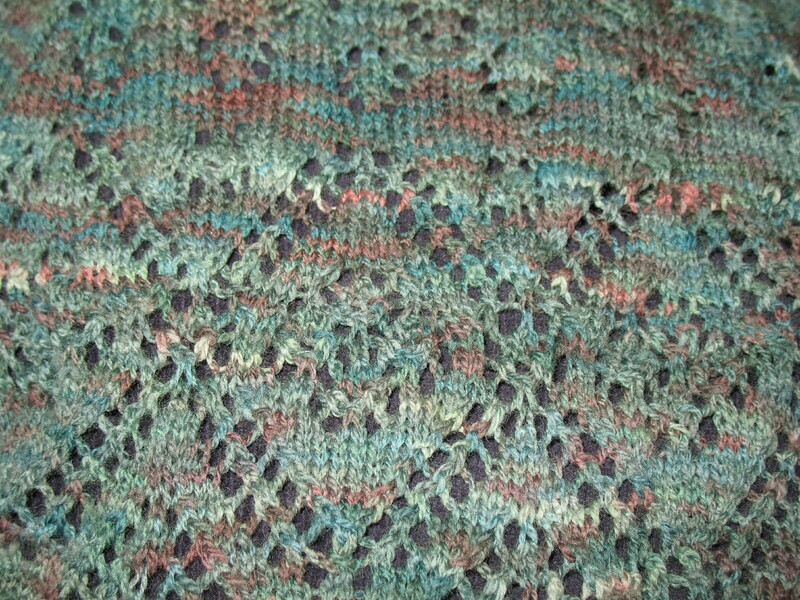 The yarn is the Green Line Worsted (organic merino) from Lorna’s Laces that I bought last fall from Jimmy Beans. It’s incredibly soft, and people are giving me a disbelieving look when I tell them it’s 100% wool. 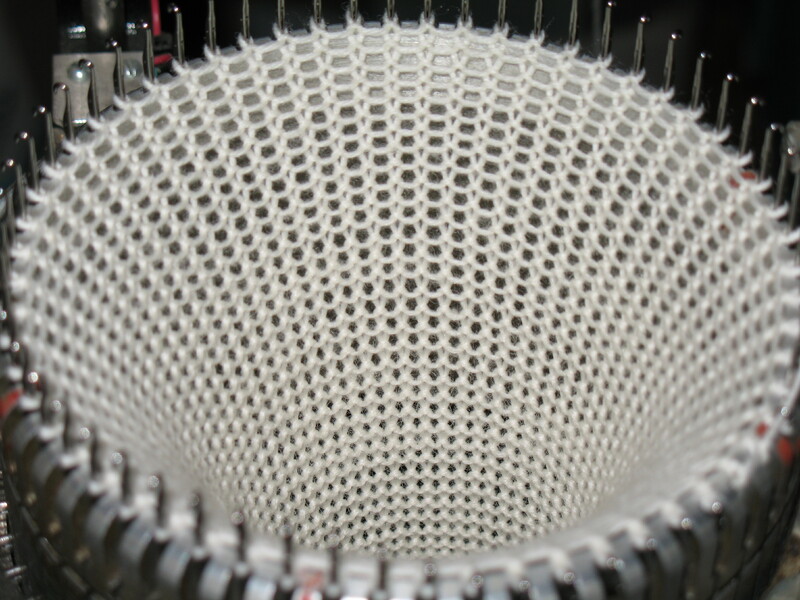 The photo is just the center cable with a hint of the Trinity Stitch panels. 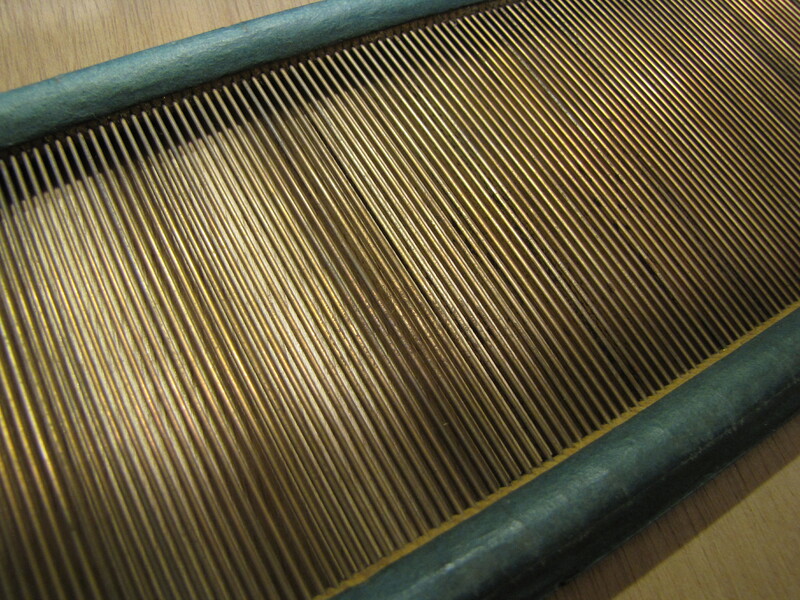 There is a Basketweave on each side of this as well, and when the piece gets big enough that I can fill the frame with the entire width of the panel, I’ll post it for the full effect. 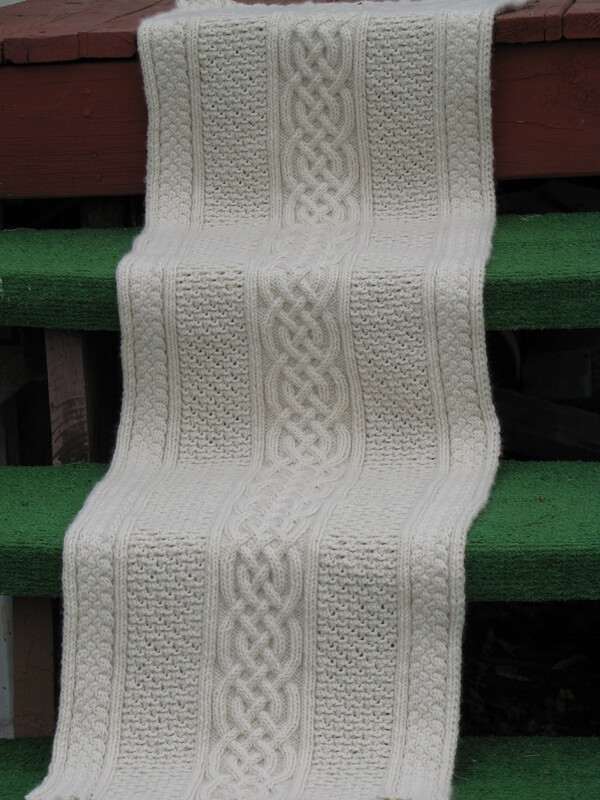 The pattern is by Anna Dalvi, and it’s available for free HERE or on Ravelry. Anyone else up for a 2011 Burridge Challenge? This is going to be so much fun – and I’d love to have some company and see your project updates if you do! Just a quick celebratory post. 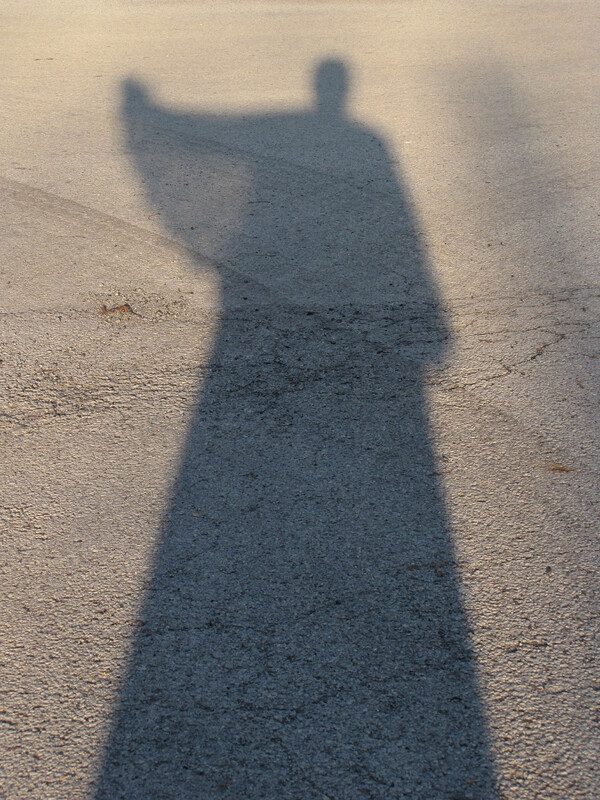 No matter what 2011 brings, one of my goals will be accomplished. 🙂 I’ve sent in the paperwork to set up an automatic investment deposit. It’s not much, mind you, as paying off debts has a higher priority for me, but I did the math and discovered that if I’d done this back when I opened the account in the first place, it would be thousands by now. Oh, the joys of procrastination. 😦 However, I don’t have a time machine, so I will just have to relish the fact that this little need that I’ve put off for over a decade took me about an hour of effort in the end. One goal down; 39 to go!